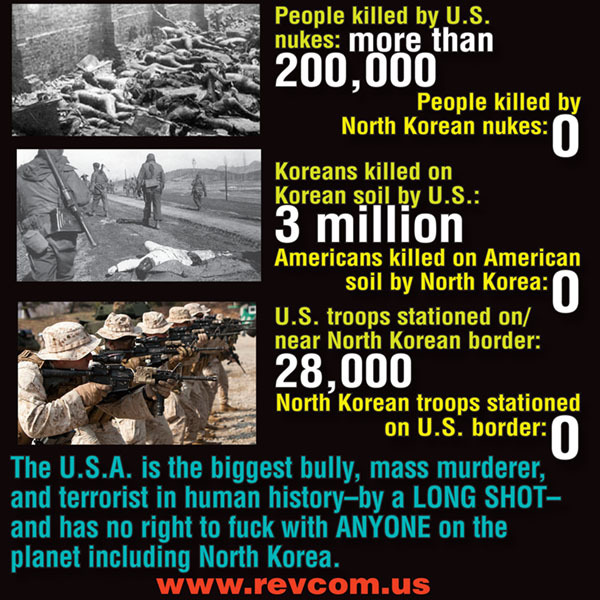 Why Do the U.S. Rulers Consider North Korea “Dangerous”—and What Does That Say About the Danger of the Trump/Pence Regime to Humanity? In the midst of the barrage of “coverage” of Korea in the mainstream imperialist media, one thing to take note of is that many of the “military analysts and experts” who have been featured say that Kim Jong-un and others in the North Korean leadership are not going to launch a “first strike” nuclear attack against the forces of the U.S., South Korea, or Japan. They note that Kim and others know such a strike would certainly lead to the devastation of North Korea and the end of the regime. For instance, William Perry, who was defense secretary under Bill Clinton, said on CNN, “I do not believe that the North Korean regime is suicidal. Therefore I don’t believe they’re going to launch an unprovoked nuclear attack on anyone.” These “experts” say that North Korea’s development of nuclear weapons—and missiles capable of delivering them, including over long distances—is essentially for deterrent purposes. They are for deterring (in other words, discouraging or preventing) others from attacking North Korea. Now, let’s be clear—these U.S. “military analysts and experts” are no “peace advocates” and opponents of American dominance over the world. Their arguments are based on what is best for the interests of U.S. imperialism. So let’s follow the logic here. If North Korea is not going to launch a “first strike,” then why does it pose such a “threat” and why are its actions “dangerous” or “provocative”? The only logical answer is that the development of nuclear weapons and missiles could serve precisely as a deterrent, and render North Korea less vulnerable to bullying, and possible aggressive military actions, by the U.S. and its allies. So, in reality, the Trump/Pence regime, now at the helm of U.S. imperialism, is threatening and taking actions that could lead to a major—possibly nuclear—war, because an adversary is doing things that might make it less vulnerable to bullying and aggression by these imperialists!! "The interests, objectives, and grand designs of the imperialists are not our interests—they are not the interests of the great majority of people in the U.S. nor of the overwhelming majority of people in the world as a whole. And the difficulties the imperialists have gotten themselves into in pursuit of these interests must be seen, and responded to, not from the point of view of the imperialists and their interests, but from the point of view of the great majority of humanity and the basic and urgent need of humanity for a different and better world, for another way." Let’s proceed further according to logical, rational thinking: While the North Korean regime is in fact oppressive and not at all a genuine “socialist” or “communist” state, or a force for progress in the world, it is the U.S., ruled now by the Trump/Pence fascist regime, which poses the real, and very dangerous, threat in this situation, and indeed is the greatest oppressor in the world and threat to the future, and very existence, of humanity. This is underlined by the “tour of bellicosity” that Pence just took in the region, even going right to the demilitarized zone in Korea to threaten war. And, speaking of the danger of a fanatic who’s threatening war—you have it, right there in Mike Pence, a religious fundamentalist lunatic threatening war while representing a system and a fascist regime with its hands on weapons of mass destruction, in fact the world’s largest arsenal of nuclear weapons!